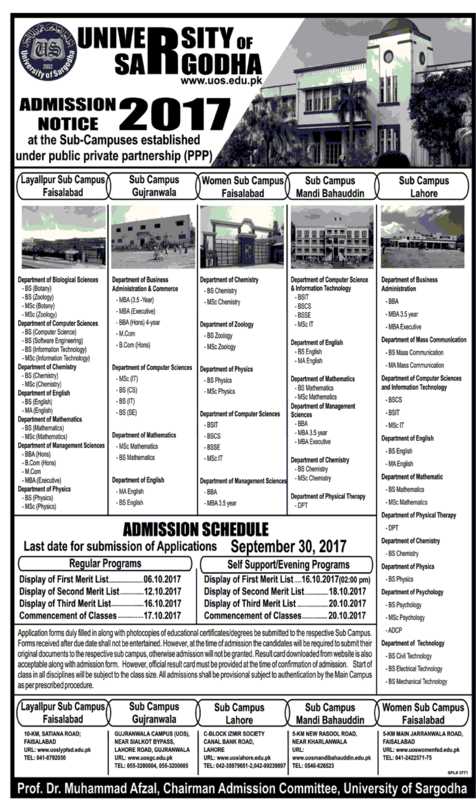 The University of Sargodha has starts the admissions for the session 2019 for the various programs so if you are eligible for the admission and you are meeting the eligibility criteria so you must apply for the admission and must appear in the Admission entrance test. For you help we provided the online testing service to preparations online, So you must try it. Here you can get the Applying dates and schedule for the Admission forms. after the Form submission due dates applications will not be considered. You can get the Entry test dates and centers information here as well. after the Entrance test you must stay with us here on this page because we will provide you the result and merit lists as well. Prospectus along with admission form can be obtained now which must be submitted to the authorized department till September, 2019. Prescribed application forms duly filled in and supported by the copies of educational certificates/degrees be submitted to the Chairperson of the respective Department by 30th September, 2019. Last Date For Submission of Applications on All Programs is 30th September,2019. Note: Start of class of all regular programs will on 17th October, 2019. Registration Fee: The Symposia registration fee is Pak Rs. 1000 for faculty and Pak Rs. 500 for students (in case of stay add Rs. 1000 per night maximum for two nights) which includes the cost of symposia material, refreshments and lunch during their one day stay at University of Sargodha. It is important to point out that travel grant is not available for participants. All participants can register in advance using online registration form (CLICK HERE) manual registration form attached herewith. Entry test is necessary for BS program in sgd university?